Rubens hired someone else to paint Medusa's snakes. The Greek hero Perseus has just cut off the head of Medusa which is lying on top of a cliff. The face of Medusa is very pale, her lips are black, and her pupils rolled down. A substantial amount of blood comes out of her neck. Medusa was one of three sisters who had brass hands, sharp teeth, and hair consisting of living venomous snakes. She was the only mortal one among the sisters. Perseus is sent on a quest to kill Medusa, but this is not easy as everyone who looks at her directly will turn into stone. In the end, Perseus kills her by looking in a mirrored shield he received from the Greek goddess Athena. This mythological story has inspired many great artists over time, including Caravaggio who painted Medusa on a shield, and Antonia Canova who sculpted Perseus with the Head of Medusa. Peter Paul Rubens, the most popular painter of his generation, has created a horrific but beautiful version of the beheaded Medusa. Possibly even more impressive than the severed head are all the snakes. Rubens did not paint these snakes himself but used the help of Frans Snyders, a specialist in painting animals. Snyders painted a variety of snakes with different skins, shapes, and folds. On the top right, two snakes are biting each other, which may be part of a mating ritual. On the left, several snakes are wrestling with each other. Small snakes are born from the blood that pours out of Medusa’s neck and in the middle foreground is a small two-headed snake. Check the blog post on www.tripimprover.com for some more details about these snakes. Snyders also includes a fire salamander, two spiders, and a scorpion in the foreground. Rubens was a very popular and productive Flemish painter in the first half of the 17th century. Some examples of his great works are Samson and Delilah and Daniel in the Lions’ Den. He achieved his enormous productivity by employing a large workshop in Antwerp. He also frequently collaborated with other established artists. Another successful collaboration between Rubens and Snyders is Prometheus Bound where Snyders painted the large eagle. 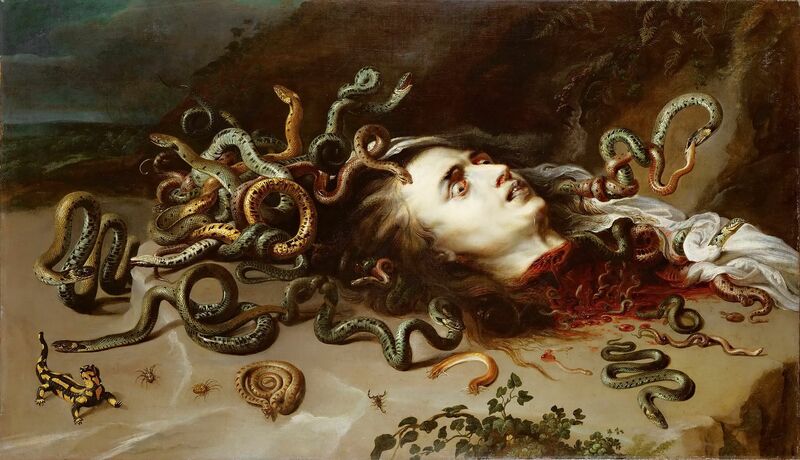 There's no way to make a severed head look beautiful, but it seems Rubens tried to make this image of Medusa particularly repulsive. From her glassy horror-filled eyes to her slithering snake hair, Rubens version of the tale of Medusa is gruesome. According to Ovid, Medusa was actually stunning and had exquisite flowing locks that would put Rapunzel to shame. However, Poseidon raped her at a young age in Athena’s temple, and for some illogical reason Athena found it appropriate to punish her by turning her hair into snakes and making her face so horrid that it would turn onlookers into stone. Talk about victim blaming. She was now a horrible monster all because of the God of the Sea’s actions. The motion of his ocean doomed her for the rest of her life. Nowadays, people try to pin Medusa as a heartless wench, but I would be pissed too if the gods had destroyed my life in such a callous way. As I am sure you can tell from this painting, things never really turned around for Medusa. The "hero" Perseus ultimately beheaded her in her sleep. As deathly horrifying as her face is, I would say the most stunning aspect of this painting is the intensity of her hissing, writhing tangles. But it turns out Rubens didn’t even paint the snakes! He contracted fellow animal painter Frans Snyders to execute the snakes, lizard, and bugs. I have to say though, he did such a great job I'm almost inclined to ask for the reptilian looknext time I'm at the salon. Ssstylin'. Medusa is a c.1618 painting by the Flemish painter Peter Paul Rubens, showing the severed head of Medusa. The snakes in the painting have been attributed to Frans Snyders. It is in the collection of the Kunsthistorisches Museum in Vienna. Another version is held in Moravian Gallery in Brno. Check out the full Wikipedia article about Medusa (Rubens).